Most hitting changes are subtle and small. Even to the trained eye it can take time to notice a change a hitter may have made months ago. 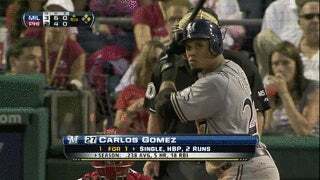 The emergence of Carlos Gomez, All-Star, goes hand in hand with a swing change he made at some point between July 6 and 23, 2012. Before looking at those dates, let's get familiar with Gomez as a player. He came into the league in 2007 with the Mets before being traded to the Twins in the Johan Santana deal. As a prospect, Gomez was a fascinating case study. I found reports going back to 2006 praising his raw natural power, but it simply never showed up in games. (E.g. "Power is not there now, but potential is there once he adds bulk to his long, lanky frame. "—Kevin Goldstein.) Where his power would take time his speed was immediate and his ticket into a big-league lineup. He never broke double digits in home runs in the minors but he stole over 100 bases combined his first two years on the farm. This was a guy seemingly built to lead off. Watch how his hips and hands work. His hips are rotating as he makes contact. His hands move on a very flat plane before reaching out to contact. His lead arm is away from his body at the point of contact. After contact he finishes with his hands below his shoulders. Also watch how his back arm works. At the deepest point in his gather phase his back elbow is below his shoulder. Usually hitters have their elbows around shoulder height at this point. The next movement would be to turn the barrel using both the hands and back elbow. The hands turn while the back elbow drives forward and down. It's a tough movement to explain so we'll yield the podium to Professor Cabrera. Reyes and other more contact-oriented hitters will get the elbow down early to help control the bat, as it's easier to control one body part (hands) than two (hands and elbow). (See also: Ichiro.) This movement makes the hands take on more importance since the elbow and shoulder have a reduced ability to drive the bat. Hitters looking to slap the ball around can utilize this movement pattern but it's not a style meant for the majority of players. Now look at Carlos Gomez taking some hacks. These are from 2008, when he was still being touted as the next great leadoff hitter. His hips and hands work much more like a typical power hitter. His hips begin to clear before his hands ever begin to move forward. They are fully rotated before contact. His hands stay close to his body and rotate to the zone with his shoulders. His lead arm is very close to his body at contact. From the front you can see how different types of hitters use their hips. At the midway point of the flight of the ball Reyes has not begun to clear his hips. In Gomez's case, his hips have begun to clear. Gomez is much more forceful with his hips and this shows up at the end of his swing. The torque created by the early clearing of his hips has rotated his shoulders fully around to the point where it appears his back shoulder has traded places with his front shoulder. Reyes gets maybe 75 percent of this rotation. Gomez keeps his back elbow at shoulder height until his front heel gets down. When he does launch his hands through the zone he finishes with his bat just a bit higher than his shoulder. Gomez does not have the mechanical profile of a contact-oriented leadoff hitter. His swing was built to drive balls. It took him until 2012 to finally take the leash off his swing. Fast forward to that year. Here he is on July 6, hitting a triple. His stride is small and quick. He generates decent torque. His front foot spins out awkwardly like he's trying to prevent his hips from opening too far. Thanks to strength and a lightning-quick bat, he is able to drive the ball off the wall and use his speed to cruise into third with a triple. 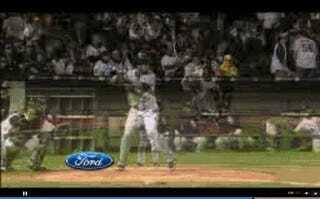 This is a power hitter's swing trying to wear the mask of a leadoff hitter. Here he is on July 23, hitting a home run. His stride is now bigger and more aggressive. He starts his weight coming forward earlier in his swing. His torque is exaggerated and his front foot flies open. His extension is more pronounced. Most of all, there is intent and acceptance. The acceptance comes in Gomez finally finding his swing. The intent is no longer to set the table for somebody else. The intent is to violently clear the damn table and let the other team pick up the mess. The bigger leg lift is the obvious mechanical change but not the most important. The most important change is how early he starts. 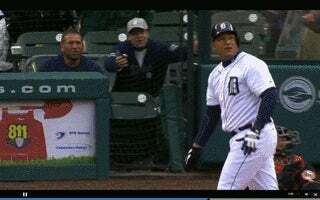 In both the 2008 and early-2012 clips he doesn't stride in any meaningful way until two or three frames before the pitcher releases the ball. (In 2008, he used a double-tap to line up his stance but transferred no energy in this movement.) 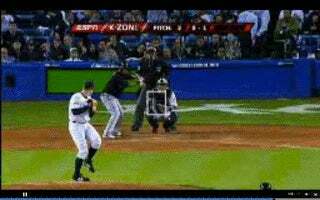 From late 2012 on, his stride occurs eight to nine frames before the pitcher's release. His new swing allows him time to begin to transfer weight forward and align his swing well before contact. Doug Thorburn has said that modern pitching reinforces the values of balance and control. Hitters fall into this same paradigm of gaining balance and control at the sake of athleticism. Carlos Gomez suffered through years of trying to be a type of hitter he simply wasn't in order to let his speed play. I can understand this. A prospect's 60 speed will have an impact on the game whether it's an A-ball or big-league game. A prospect's 60 power may not be a factor until he has figured out the evil masterminds that are major-league arms. A bigger leg lift is not always the answer—let me be clear on that. 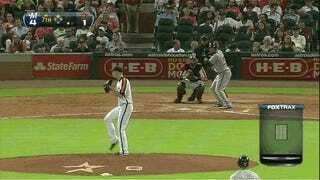 The new Carlos Gomez swings with intent to do some serious damage to the ball. He is also giving himself enough time to unleash all that stored energy. The bigger leg lift is simply the physical manifestation of that newfound intent. Carlos Gomez's new swing may not be what his past coaches envisioned, but that swing has turned him into an All-Star. 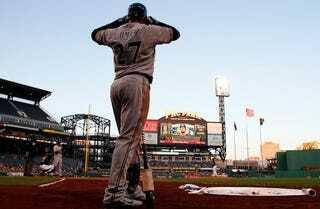 Is Oakland's Run Differential for Real? Ryan Parker is an author of Baseball Prospectus, where this story originally appeared. Click here to see Ryan's other articles. You can contact Ryan by clicking here. Photo via Getty.